Tuesday May 22nd 1883 Mother went to town in the morning and Hatt and Edith came back with her and just before supper I helped take Edith home and stayed to Hatts till after supper. I came right home in the afternoon evening to help with the work. I finished a hood for Edith. Wednesday May 23rd 1883 I helped a little about the work this morning and went up to Mrs Fletchers with Hatt to spend the day we had a very pleasant visit with her sisters that were there. I came on home before supper and helped with the evening work. 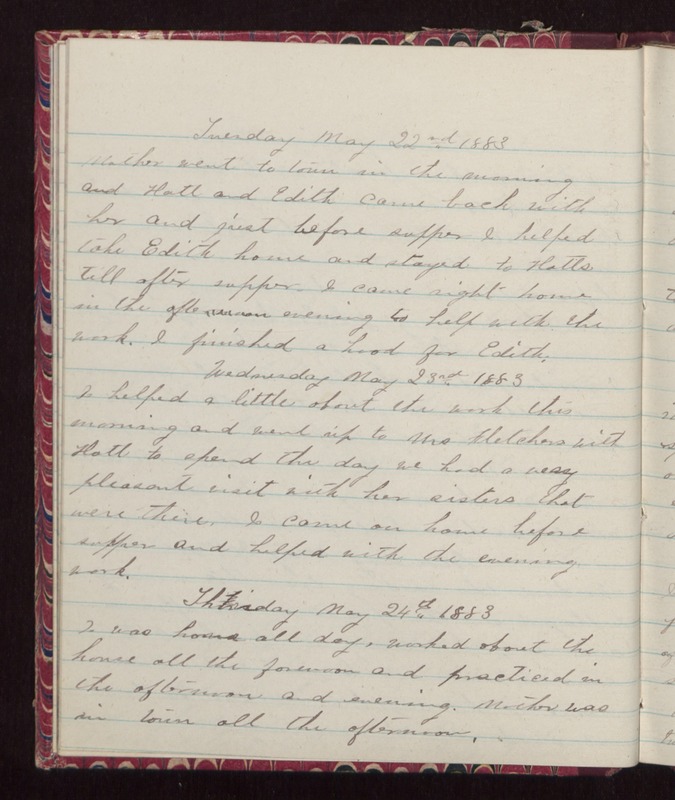 Thursday May 24th 1883 I was home all day, worked about the house all the forenoon and practiced in the afternoon and evening. Mother was in town all the afternoon.